Physicians contribute to objective successful aging by providing good treatment and helping patients maintain good health and avoid illness, but health care providers typically pay inadequate attention to behavioral health issues. The shift that is occurring from individual to group medical practice creates new opportunities for physicians to help their older patients to age successfully. This article discusses the meaning of successful aging and outlines ways in which both private group practices and community health centers can help older adults to age well. Objective concepts of successful aging focus on measurable physical and mental characteristics. People are regarded as aging well objectively if they are physically and mentally healthy, not disabled, cognitively intact, and involved with other people and activities. Objective successful aging is more common in younger old age (ie, ages 65 to 80) when it is more likely that older people are in good physical condition for their age, are fully functional, and generally remain energetic and active. • coming to terms with mortality. One of the reasons aging well strikes many people as an oxymoron is that the challenges associated with aging appear so overwhelming, especially to younger people. But the fact is old age is also rich with unique opportunities. A new identity crisis makes it possible for older adults to move in new directions or to return to paths not previously taken. It is also possible for older adults to take pride in their past and to find satisfaction where once there was ambition. People who are aging well subjectively generally meet the developmental challenges of aging, though no one meets them totally. And older adults can appreciate and take advantage of some of the unique opportunities aging offers. Typically they share characteristics such as a positive attitude, a sense of optimism, resilience, and adaptability—traits that generally are acquired during the course of their maturation. They also maintain active relationships with people they care about and who care about them, and they pursue activities they find enjoyable, engaging, and meaningful. These activities may include paid work, although most people retire eventually; often, they include volunteer work. They also can include new active roles within the family, such as becoming grandparents. Older people who are happy with their lives also derive great satisfaction from hobbies, creative activities, travel, education, and from involvement as appreciative spectator of sports and the arts. Health care providers are generally attentive to the factors that contribute to objective successful aging, including good health, cognitive capacity, and the absence of functional disability. Subjective successful aging, however, is another matter. • increased use of integrated treatment team models. In addition, wellness has become an increasing focus for health care providers. This essentially means helping people to maintain or improve their health, usually through weight control, smoking cessation, limited use of alcohol and other addictive drugs, good nutrition, and adequate exercise. Of course, there's nothing new about this approach in standard medical practice. For many years physicians have been advising their patients to lose weight, stop smoking, and exercise. However, patients often ignore their physicians' advice. The key to effective wellness is helping people to do the things they know they should do. In addition to providing health education, it can be helpful to engage patients in group approaches to smoking cessation, weight control, exercise, and confronting addictions. But a great many individuals simply aren't "joiners." Lifestyle changes occur when people are motivated to change. Increased use of motivational interviewing in physical and behavioral health practices could make a big difference. Individualized wellness coaching has also emerged as a way to help people incorporate healthful behaviors necessary to preserve or improve their health. What health care providers can and should do to promote subjective successful aging is far from obvious. Is it really the responsibility of health care providers to promote self-esteem or to help their patients maintain or develop social connections and engage in activities they find pleasurable and/or meaningful? Don't health care providers have more limited responsibilities, such as health promotion, illness prevention, treating disorders, and rehabilitation? Aren't they already too busy with their traditional responsibilities? These are reasonable questions. But they may be more reasonable in the context of individual private practices than in the context of large private group practices and community health centers, which are able to provide staff for health education, wellness coaching, and other functions. Given the shift to group practice, the roles and responsibilities of medicine are ripe for review. • Diagnostic practice and treatment choices that include patients' life goals and treatment preferences: Concern about subjective successful aging leads to an emphasis on providing medical care and other services that help older adults maintain a positive sense about their lives despite having the kinds of chronic health problems that are common as people age. This entails distinguishing between the so-called best treatment and the other interventions that can result in the quality of life a patient prefers. For example, Mulley et al, in an article in which they advocate for a "preference diagnosis" as well as a medical diagnosis,9 discuss a 78-year-old woman with breast cancer who had had a successful mastectomy but came to regret her decision when she later learned that she could have chosen a nonsurgical treatment and avoided the trauma of surgery and a difficult recovery. Skilled geriatricians ask patients not simply what and how they are doing medically but also about life in general. Atul Gawande, MD, MPH, a surgeon at Brigham and Women's Hospital and a professor in the department of health policy and management at the Harvard School of Public Health, provides an example of this in "The Way We Age Now. "10 Observing a geriatrician's examination of a woman in her mid-80s, he is struck by how the physician is largely ignoring the patient's metastatic cancer, and instead asking the woman for details about how she spends her days, along with examining her feet. It's obvious that his concern about preventing falls and supporting her remarkably positive attitude about her life supersedes any futile attempts to treat a slowly growing cancer. The geriatrician shared with Gawande, "The job of any doctor … is to support quality of life … [including] as much freedom from the ravages of disease as possible, and the retention of enough function for active engagement in the world." Taking an interest in patients' lives and crafting diagnoses and treatment plans to help them derive maximum satisfaction from their lives is one of the key elements of a medical practice designed to support subjective successful aging. • Wellness coaching for subjective successful aging: A form of wellness coaching is emerging that goes beyond physical concerns and seeks to help older adults to get the most out of life in old age. For example, Kendal Outreach and Hebrew SeniorLife, affiliated with Harvard Medical School, have jointly developed Vitalize 360, an assessment and coaching program that helps individuals develop and pursue a personalized vitality plan to identify and achieve their personal life goals. An interdisciplinary team provides needed assistance. • Concierge services: Large medical practices with nutritionists, care managers, and mental health professionals such as social workers on staff to promote wellness and to address behavioral health problems could also employ staff to help isolated and inactive older adults to connect with local resources. In all parts of the country there are Area Agencies on Aging (AAAs) that can help establish these connections. A working relationship between a medical practice and the local AAA (usually a municipal, county, or regional department of aging services) makes good sense. It also makes sense for some private medical groups and perhaps community health centers, to have a "concierge" available to help people to make connections in their communities, as they do in VIP units in some hospitals. • Community education: Health care and mental health centers and group practices should provide education related to successful aging similar to the community health education most now provide for smoking cessation, weight loss, and diabetes management. These materials could be designed to provide opportunities for making social connections as well as encouraging the pursuit of personal interests. In proposing substantial additions to current community-based physical and behavioral health practices, we realize that one initial response will be, "How will we pay for these new kinds of services and for the additional time physicians will need to spend with patients to learn about their lives?" • Adding some of these services will help the practice meet the requirements to be recognized as medical homes, yielding higher reimbursement rates. • Federally qualified health centers can fold some of these costs into their cost base and receive increased rates. • Some patients can and will pay for these services. Many already pay for similar services, such as a membership in a gym, yoga classes, and elder care management. • Some of these services will attract well-insured older people, not a minor matter in environments where market share is so competitive that health care providers spend significant money for advertising. Obviously, older adults comprise a substantial and growing portion of the clientele of medical practices. For this reason, it is both good health care and good business to focus on helping older adults to age successfully. — Michael B. Friedman, LMSW, is the cofounder and honorary chair of the Geriatric Mental Health Alliance (GMHA). He is on the adjunct faculty of Columbia University School of Social Work. — Lisa Furst, LMSW, MPH, is the director of education for the GMHA and the director of the Center for Policy, Advocacy and Education of the Mental Health Association of New York City. — Kimberly Williams, LMSW, is the cofounder and director of GMHA and vice president for Integrated Policy and Program Solutions of the Mental Health Association. The Home Instead Center for Successful Aging at the University of Nebraska Medical Center provides primary care, medical consultation, assessment of health and functioning including memory assessment, fitness and wellness programs, wellness coaching, falls prevention, and health education programs. The New Jersey Institute for Successful Aging also provides behavioral health services and house calls. 1. Jeste DV, Depp CA, Vahia IV. Successful cognitive and emotional aging. World Psychiatry. 2010;9(2):78-84. 2. McLaughlin SJ, Connell CM, Heeringa SG, Li LW, Roberts JS. Successful aging in the United States: prevalence estimates from a national sample of older adults. J Gerontol B Psychol Sci Soc Sci. 2010;65B(2):216-226. 3. Montross LP, Depp C, Daly J, et al. Correlates of self-rated successful aging among community-dwelling older adults. Am J Geriatr Psychiatry. 2006;14(1):43-51. 4. Erikson EH, Erikson JM. The Life Cycle Completed. New York, NY: W. W. Norton & Company; 1997. 5. Friedman MB, Furst L, Gellis ZD, Williams K. Identifying and treating anxiety disorders. Aging Well. 2012;5(3):14-17. 6. Vaillant GE. Aging Well: Suprising Guideposts to a Happier Life From the Landmark Harvard Study of Adult Development. New York, NY: Little, Brown and Company; 2002. 9. 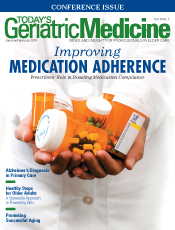 Mulley AG, Trimble C, Elwyn G. Stop the silent misdiagnosis: patients' preferences matter. BMJ. 2012;345: e6572. doi: 10.1136/bmj.e6572. 11. Jeste DV. Promoting successful ageing through integrated care. BMJ. 2011;343:d6808. doi: http://dx.doi.org/10.1136/bmj.d6808. 12. Sundaram JP, Montross LP, Meier EA, Martin AS, Daly R, Jeste DV. More than just better physical health: can integrative medicine increase sagacity in older adults? Am J Geriatr Psychiatry. 2014;22(3):S101-S102.